One of my 52 in 52 items for 2014 was to blog 100 memories. Today’s post focuses on memories with friends. These memories are not in any specific order, other than in which order they came from. 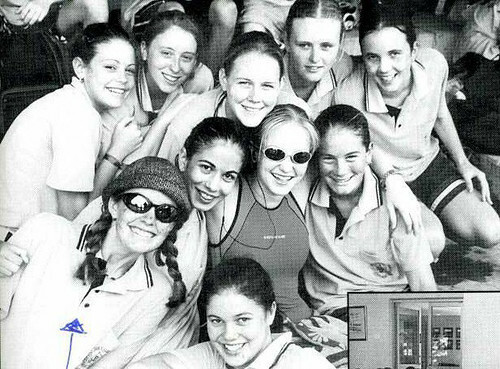 I used to dread the school swimming carnival, because it meant one thing: showing off your body to the boys. On reflection, I was fit back then and would kill to be that toned nowadays. But back then I was so self conscious and wore boardies as much as I could. Then I became a senior, and suddenly the swimming carnival took on a new meaning. I remember giving a speech to the kids in our house colour (about 200 of them) about how we were going to win the day overall not by being the best, but by giving the most. I told them how I didn’t care if we were first or last. I just wanted to saturate the races with blue (our colour). We overwhelmingly won that day, no other colour was anywhere near us in terms of points. We had so many kids in so many races that we truly won not from skill, but by sheer determination to be involved. The kids all had fun, we sung and chanted, and we had our own inflatable dolphin mascot that I had spray painted blue (and in the process got spray paint over the driveway at home – sorry mum). We even had a kid who couldn’t swim compete in a race! He doggy paddled the 50m pool while the rest of us lined the pool cheering him on. I cried, and thinking about it now makes me get a bit watery now. It goes down as one of my favourite moments of high school. I fell in love with soccer/football when my sister, Amyo, dragged me to a socceroos qualifying match. “Just try it, you will love it” she said. Until that point I had complained bitterly about soccer. I didn’t understand how someone could watch a game for 90mins and at the end of it potentially come out without a single goal. I was used to NRL, Rugby League, where tries were common and awarded 6 points each time. But I agreed, and she was right. I loved it. It wasn’t the game that got me at first. It was the noise. The crowd singing and chanting, the cheering over some well-placed passes. Then I started to pay attention to the game. The skill in managing the ball, directing it where to go, having the foresight to see where another player might be. So when it come to the crucial game against Urugauy to see if Australia would make it to the prestigious World Cup for the first time in over 30 years, and only the second time in history, I was keen to watch. Unfortunately, my boyfriend at the time didn’t have the same idea. I begged and pleaded to no avail. He and his friend played a PlayStation game, until the point that surely the game was over. I flicked the channel to see, and was presented with the penalty shoot out. We had made it to penalties. I cried. I cheered and shouted. No one else in the house cared. I did though, and I knew the gravity of what had just happened. History had been made, and the face of soccer in Australia had been changed forever. And I had only just made it in time to witness it for myself. As a result of my newfound love for soccer, I began to follow “Brisbane Roar”, who back then were known as “Queensland Roar”. When I began following them they weren’t doing very well. I didn’t mind though, I just refused to follow a team from any other state (based on my love of Queensland, explained in the next section below). I watched games, attended a few with my sister, and slowly but surely my loyalty grew. I one day said “if we ever make the grand final, I’m going, I don’t care where it is”. The very next season we made the finals, which was promising. Then we won our games in the finals, which was more promising. Then we got to the game that if we won, we would get into the grand final. My sister was out of the state, other friends couldn’t go. I decided I would always regret it if I wasn’t there, so I put out a tweet to see if anyone else was attending. An online friend replied (which is how I met @hellyeahkate and her now husband @warwickkay), and when we scored a goal in the dying seconds to get into the grand final, I shed a tear. We all high-fived, it was a great moment. The grand final is one that will go down in history. As far as the game went, at 90mins it was 0-0. In overtime, the opposition scored in quick succession in what seemed to seal our fate. With 5mins to go we scored a goal, and it was looking promising. With only a few minutes remaining, the stadium began to empty out. People had given up and assumed we would lose. Then with only seconds to go, we scored again to become even. The people trying to get back into the stadium were turned away. We won. It was beautiful. As far as the spectating went, it poured rain on us during the game. It was dismal when we thought that we were going to lose, and we had gotten wet for nothing. I had scored some plastic bags to ensure the valuables were safe, but we were cold and disappointed. We had paid good money for the seats, and as tempting as leaving to get dry sounded, we wanted to be there for the boys on the field so they would see that we hadn’t given up. And worst case, we needed to be there to support them in case they didn’t come out on top. I lost my voice for several days after that game. I had cheered so loudly, screaming to the point of torturing my vocal chords, but I regret nothing. When we won, I cried. My sister cried. My friend, Tina, cried. Then we danced. We danced all the way back into the city. My favourite live game ever. I can still watch the penalties and cry. In searching for the youtube video now, I just did cry. Wuss. In Australia, there is an annual series of NRL (National Rugby League) football of 3 games played between Queensland and New South Wales. Best out of 3 wins. It’s typically the most brutal three games of Rugby of the entire year. It doesn’t matter if your team mate, who you play with week-in-week-out, is playing for the opposition, during those games you will kill him. He means nothing to you. The tackles are harder. The players push harder. It’s tough. As spectators, friends hate friends during these games. We all throw insults in every which direction. My dad taught me about passion for sport, and emotional participation. We yelled at the screen during those games together, and ate our salted peanuts. It’s hard to explain to Mario why these games are so important to me, but it’s a tradition bred into me since I was young. You prepare a good feed, you watch the tv, and you yell as loudly as you can. If you’re old enough, you throw in the odd swear word or two. Ah netball. The bane of my existence. At one point I was playing 5 games a week – one on Monday (ladies team), twice on Thursdays (two mixed teams), and twice on Saturdays (Superleague). I have so many injuries related to netball. My ankles are weak with visible spider veins from countless rolled ankles, and I fractured one of my leg bones when I jumped, came down and landed on someone’s leg and fell over (I walked on it for 4 days thinking I had just rolled my ankle again). The worst injury was when I tore my ACL ligament and required a knee reconstruction. That particular game was just a week after we finished superleague for the season. My team had made it to the grand final that year, where unfortunately we lost. But I was damn proud of my efforts, and felt I had played my best defense of all time. This game was just an in-house game, where I never really put in the same effort as superleague. I could never be rough with my friends, so while I still defended and definitely tried to get the ball, I didn’t try and shove people out of the way or put my body on the line. In comparison, when I put on my superleague uniform everyone on the opposition was dead to me and I would do everything I could (without being dirty) to ensure victory for my team. At the time of my injury, I was running down the left hand side of the court tracking my opposition, when she changed direction and headed into the goal circle. I turned to follow, and instead fell on my bum. I had no idea what happened, all I knew was that my leg felt funny. There wasn’t even any pain. It just didn’t feel “right”. There wasn’t even any drama to my fall. It was like I turned around and sat down. No spectacular flying across the court to get in the way, or even a collision with a player. I was by myself, and I wasn’t getting up in a hurry. They helped me off the court, and when I pointed to the general direction of where it hurt, it was assumed that I had perhaps just dislocated my knee (although we couldn’t really explain the lack of pain). We iced my knee, and I hobbled back to the car; thankfully my partner at the time was there and could drive home. We had a set of crutches at home, so I strapped my knee up and used those for the next week, where after an incorrect diagnosis from a regular GP, eventually a sports doctor was able to tell me I had “done some real damage here”, and sent me off for the scans that would prove that surgery was required. Next PostNext Is the weekend already over?